To address water runoff pollution, Virgina Commonwealth University’s (VCU) Center for Environmental Studies announced it will partner with Armstrong High School students on a project to map an area and develop a green infrastructure plan around Richmond, Va. The study is supported by a $59,773 U.S. Environmental Protection Agency (EPA) grant. “Because this area is so impervious, no water is penetrating through the ground and filtering through the natural processes,” said Jennifer Ciminelli, research and data coordinator for the Center for Environmental Studies and Rice Rivers Center. VCU is the only recipient in Virginia and one of only 22 nationwide. Greg Garman, Ph.D., director of the center, is principal investigator and Ciminelli is co-principal investigator. The project will partner with VCU’s Office of Sustainability, Rice Rivers Center and Division of Community Engagement. The neighborhood associations of Carver, Jackson Ward and Monroe Ward, and the Richmond Department of Public Utilities and Richmond Public Arts Commission will provide support. “The storm water and sewer water go into the same pipe, which is true in a lot of older cities such as Richmond,” said Wyatt Carpenter, sustainability project coordinator in the Office of Sustainability and staff support for the grant. People swim in, fish from and relax around the river. “It’s a public health concern, as well as an environmental concern,” Carpenter said. 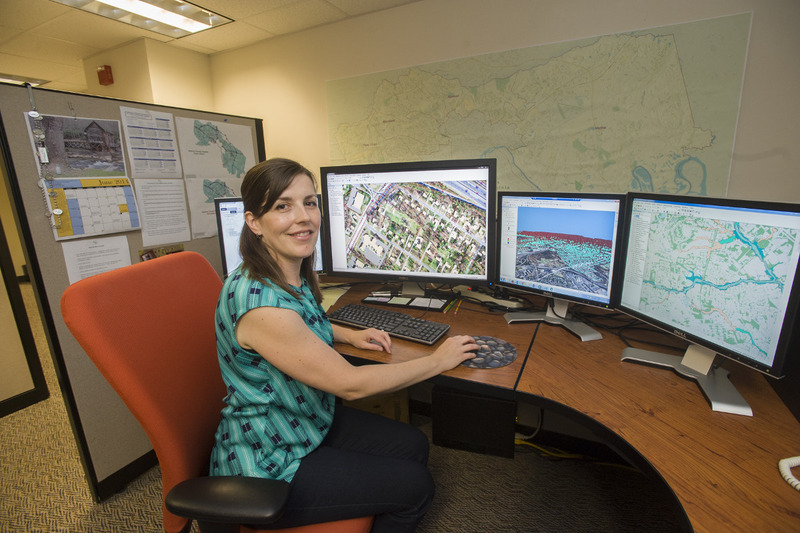 Researchers will use geospatial technology to map storm water issues. The information will be shared with Richmond community members, whose feedback will help guide the final greening plan. At the same time, educational modules on related topics, including GIS technology, watersheds, public health and storm water management, will be developed for use in Richmond City Public Schools. Armstrong students will help develop an application through which the public can identify different neighborhood features, such as areas that flood in downpours and vacant lots that could house a community garden or artwork. Rain gardens, green roofs, urban bioswales and pervious paving materials are good examples of green infrastructure that help to reduce storm water pollution. On campus, you can find a rain garden outside Harris Hall, and the Pollak Building has an accessible green roof. The community-driven plan will identify priority locations for green infrastructure projects, recommend best practices to reduce runoff pollution, and identify funding sources to foster action. Image courtesy of VCU: Jennifer Ciminelli.